Does Puremelt Chocolate contain gluten? Does Puremelt Chocolate contain cane sugar? No. All of our products are completely free from cane sugar and cane sugar derivatives. Do you use artificial sweeteners instead of cane sugar? No. We never use artificial ingredients ever – period. We only ever use low GI natural sweeteners. How do you sweeten Puremelt Chocolate? We sweeten our raw organic chocolate with low GI, raw, organic, dark agave nectar harvested from the agave cactus. We use low GI, organic, evaporated coconut nectar to sweeten our Organic Fudge and drinking chocolate. It’s harvested in small batches in Indonesia and contains generous amounts of minerals and trace elements. Is Puremelt Chocolate suitable for diabetics? We try to create chocolate that everybody can enjoy. Our bars are low GI and sweetened with raw, organic dark agave nectar or coconut nect. This means when eaten in moderation they’re suitable for people with diabetes, however it is always best to check with your health practitioner. A 15g serving of Puremelt Chocolate contains around 2g of low GI sugar. Yes. 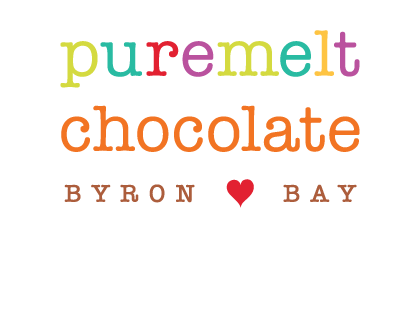 Everything made by Puremelt Chocolate Byron Bay is organic, made from 97% certified organic ingredients. Does Puremelt Chocolate contain nuts? Not all products contain nuts but Puremelt Chocolate is made in a facility that also handles nuts. Do you use soy products to make Puremelt Chocolate? No. All of our chocolate is made without the use of any soy ingredients whatsoever. We don’t use soy or soy-derivatives in our fudge either. Do you use dairy products to make Puremelt Chocolate? No. All of our chocolate is made without the use of any dairy products. We do use organic butter to make our organic fudge. Are all Puremelt products suitable for vegans? Most of our chocolates are free from all animal products and animal bi-products. Organic butter is used in our fudge and our award winning organic brownies which also contain organic eggs. We use kosher ingredients in all of our products. Puremelt Chocolate is paleo friendly. Many of the meals, snacks and treats served at the Puremelt Chocolate Lounge in Mullumbimby are paleo friendly. What is the nutritional content of Puremelt Chocolate? Puremelt Chocolate is raw, gluten free, soy free, cane sugar free and vegan (except for 2 flavours),. Puremelt is chock-full of nutrition so eating it nourishes mind. Body and soul. You can find our nutritional panels on the product pages for each individual product. Does Puremelt Chocolate contain caffeine? Cacao beans contain very small amounts of caffeine, but also contain theobromine (a similar alkaloid to caffeine). This ingredient is far less stimulating to the central nervous system than caffeine, therefore most people would not notice these small amounts. However, if you’re sensitive to caffeine it’s probably best to avoid cacao. Is Puremelt Chocolate suitable for pregnant women and children? Puremelt Chocolate is made with love, integrity and considerable care. It is free from dairy, soy, gluten and contains only natural and 100% organic ingredients, so it is suitable for pregnant women and children. Of course, we recommend seeking qualified medical advice if dealing with specific dietary restrictions or intolerances and allergies. Does Puremelt Chocolate use fair trade ingredients? At Puremelt Chocolate we are committed to the ethical sourcing of all of our raw materials. We pay fair prices supporting sustainable sources of income for local workers. All of our major ingredients are branded fair trade. We do our bit to ensure that everyone involved in production and supply is paid market price or above for their goods and services. Where does Puremelt Chocolate source its ingredients? All of our ingredients are certified organic and fairtrade where possible. In fact 97% of our ingredients are certified organic. What is the best way to store Puremelt Chocolate? Our chocolate is raw and full of amazing health promoting molecules to nourish your mind, body and soul. To ensure that you get the most enjoyment and nutrition from our chocolate it needs to be stored correctly, which is in a cool, dark place below 18 degrees centigrade. Cacao butter has a low melting point, so your chocolate will become soft if it gets too warm. We recommend the refrigerator or even the freezer as a safe place to store your Puremelt Chocolate. Be sure to keep it away from any strong odours, as chocolate and cacao absorb odours. What % cacao is Puremelt Chocolate? All Puremelt Chocolate is currently 85% cacao. You can pay via PayPal and credit card. Why did I get an error message when paying for my order? If you are paying via PayPal and you are having problems completing your order, ensure that your PayPal account is set up correctly and connected to a funding source. Also check that the address provided to Puremelt Chocolate matches your PayPal address exactly. If you are still having problems, we recommend using a credit card to complete your purchase. If this does not solve your error, please contact us on 0406 422 465. We understand you need your chocolate and you need it now. Online chocolate orders for delivery in Australia are dispatched from Mullumbimby with Australia Post or Fastways parcel services within 1-2 business days (excluding public holidays) on receipt of payment. Please check with Australia Post or Fastways for delivery times to your area. We’d be happy to help. Please visit our Contact page and select your enquiry type. How much does it cost to deliver my order? Delivery of our chocolate and fudge bars are Australia wide and we have a flat rate shipping cost of $9.